Book a 5 Course Steak Dinner with Boutique wines, at Buenos Aires `Secret Steak House only with Reservations. TANGO SHOW Book a 3 Course Steak Dinner with Boutique wines, on Wednesdays in Buenos Aires only with Reservations. The fixed 5 course dinner menu, for U$D 75.00, is accompanied by a formal presentation of all the cuts and cooking techniques. Each course has a unique wine pairing specifically chosen to accompany it. All wines are sourced from small boutique wineries around Argentina and is limited production. The fixed 3 course dinner menu & Tango Show, for U$D 100.00, is accompanied by a formal presentation of all the cuts. This is not your average steaks dinner. While it's no secret that Argentine beef is worth flying around the world for, visitors to Buenos Aires don't always get the chance to experience an Argentine asado and its many rituals and traditions. Here at Steaks by Luis we not only focus on high quality cuts grilled to perfection but also the entire dining experience. We want our guests to participate in a typical Argentine asado and feel like they're in Luis' home. While sitting around a big family table, we encourage everyone to get to know their neighbors and make new friends. We also invite you to move around the restaurant, join Luis alongside the grill or just sit back, relax and enjoy the event. The 5-course Asado includes a traditional picada, salad, achuras, the star of the evening, the Steak, and a dessert. Additionally, each course is paired with a specifically selected Argentine boutique wine to enhance your dining experience. An asado is so much more than a piece of beef on a plate so skip the parrilla circuit and join us for a night of food, wine and sharing as we bring the best of Argentine traditions into an urban, closed-door setting. Learn about the ingredients, techniques, secrets, rituals and traditions that make Argentine asados so special. Discover how Argentines prepare and enjoy their asado from actual Argentines! Have any questions? Read our FAQ or click here to contact us! Our house is situated in a unique location in Palermo, perfect for hosting small and large groups alike in a warm and comfortable setting. Also unique to our space is the beautiful parrilla (grill). You will have front-row access to it along with an Argentine host there to answer any questions and walk you through Argentina’s rich asado traditions. Luis was born and raised here in Argentina. When asked how he began doing asados his response was ‘you don’t start doing asados, it’s part of life to know how to do them’. From age 11 he was put in charge of the parrilla (the grill) taking over for his grandfather Rodolfo, an expert whose craft he observed for years. Luis estimates that he has been the asador (grillman) at over one thousand asados, which is why when it comes to having the best Argentine asado experience, Luis is your man! Why is asado important to you? Because it's a way of coming together and feeding people you care about with delicious food. When you do an asado how do you feel? Before guest arrive I am always anxious about how its going to turn out. I want it to be perfect. During the actual asado I feel comfortable, the parrilla is where I belong. Then after I am always satisfied to have provided enjoyable food for everyone. What’s your favorite part of the asado? The achuras! I go crazy for achuras!! The steak is an important part of the asado but I think I could live off of achuras. How do you feel about vegetables? I like them a lot, not as much as meat obviously, but sometimes I’ll add them to the grill and then prepare a warm salad to accompany the meat. 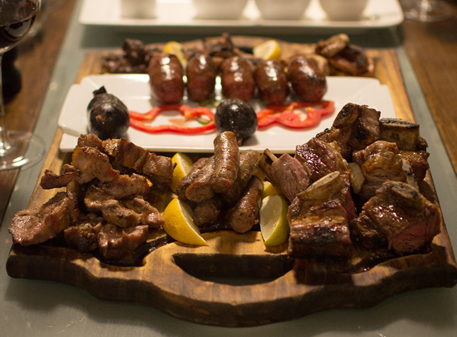 An asado is a traditional Argentine barbeque shared amongst friends and family typically featuring a selection of grilled beef and pork dishes and a healthy dose of wine. - Third course: Argentine Grilled Starters as authentic as it gets. Provoleta , Chorizo and Morcilla (pork sausage and pork blood sausage), special selected pork cut and more surprises. Does the price include alcohol? Yes, each course has been paired with a specially selected wine. Can I pick my grilling point? Yes, before the dinner begins we will ask for your preference for grilling points. 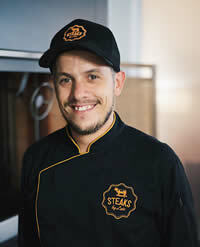 Steaks by Luis offers steaks cooked Rare, Medium Rare or Medium, and we strongly recommend the Medium Rare option. For any clients who prefer their steaks cooked to a different point, we will make every effort to accommodate those preferences. For vegetarian diners we've put together a special menu with fresh products of the day. Please note that in order to accommodate vegetarian diners we must be notified at least one day prior to your scheduled event. Our Asados take place every Monday, Tuesday, Thursday and Saturday. And on Wednesdays we have the TANGO SHOW. We estimate that the entire experience should last around 2.5 hours. Can private dinners be arranged? Private dinners can be arranged by contacting us directly. The price for the entire 5-course Asado Argentino with wine pairing menu is USD 75.00, non-alcoholic menu USD 65.00 and children between 6 and 12 years old USD 40.00. Full 3-step with wine pairing Asado & Tango Show menu is USD 100.00, non-alcoholic menu USD 90.00 and children between 6 and 12 years old USD 45.00. Specify what they are and how many guests have them. You provide your credit card information to guarantee your participation in the dinner. In case of No Show without having canceled the reservation previously, we will charge 50% of the total reservation. The value of full cover is USD 75.00, alcohol-free USD 65.00, children between 6 and 12 years USD 40.00. The value of full cover is USD 100.00, alcohol-free USD 90.00, children between 6 and 12 years USD 45.00. By confirming, you agree to the terms and conditions. All reservations must be made with a valid credit card to guarantee participation in the Asado. Cancellations must be done a minimum of 24 hours in advance to avoid further charges. Steaks by Luis will make every reasonable effort to reschedule dinners in order to avoid cancellations but cannot guarantee availability. In case of not showing up for the dinner without having canceled the reservation, we will charge 50% of the total of the reserved items to the credit card provided as a guarantee. Thanks, your comment was sent !